Once you’ve got some experience under your belt, you might find that you need to assemble a press kit. This is an informational package that provides club owners, booking agents, publicists and journalists with the materials they need to promote or write about you. 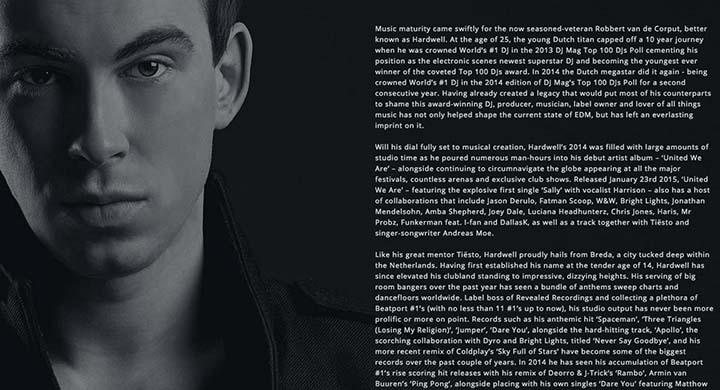 The most effective press kits are simple and elegant; if you’re sending one by email (usually referred to as an electronic press kit, or EPK), you should condense it into one PDF with clickable links to your demo mixes (see below). When you assemble your press kit, think about what your marketable strengths are, and how you can highlight them. Are you a performer? Are you technically amazing? Are you really, really attractive? Whatever the hook is, exploit it to the utmost, but don’t go over the top. With your one-page bio, the best opening is a clear, distinct message or mission statement about what you do and where you want to take your art. Keep it short and succinct; business people usually don’t have the time to read a long essay. Always consider the age, location, gender, and musical taste of your audience, and show your first draft to your friends for their input. Remember to put your contact info on everything, and package your materials (if you’re sending them by snail mail) in a simple, professional and eye-catching way. It’s also a good idea to follow up with a phone call or email, just to confirm that your intended recipient received the package. When you’re contacting journalists or magazine editors, remind them that you’re available for interviews too. In every case, this is an opportunity for you to build relationships with the people you want to promote you and your brand. Find more Marketing tips inside our ebook Beyond Beatmatching.